Working out is necessary to stay fit and healthy. Whether you workout at the gym, workout at home or go for jogging, it is important to stay active. You start working out to get in shape, improve stamina and for many other reasons and you want to see the result as fast as possible. To reach your goal, you tend to use more weights or increase the number of miles you cover daily. However, do you skip your warm up routine to start your workout routine? Then it is a big mistake. 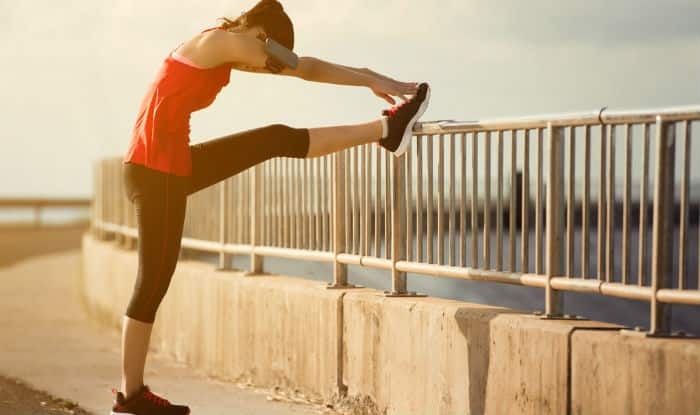 You should never miss your warm up routine as it will warm your body up and prepare it for the workout routine. Here are five warm up exercises you must do before you start your workout routine. Stretches will loosen up your body, you need to do dynamic stretches instead of static stretches. Dynamic stretches include all the continuous movements. You can touch your toes, rotate your arms in circles or stretch your back. Here is a simple dynamic stretch routine. Start by lying down on the floor on your back. Bend your knees and place your feet on the floor. Now, squeeze your glutes and push your hip up towards the ceiling. Return to the original position. Do this about 10 times. Jogging is another great warm up exercise. You do not have to go out to jog. Just jog at one place to warm your body up. Many of you must have experienced ankle sprain while working out. You can easily avoid it by doing rocking ankle mobilization. Start with the push-up position. Now, lift your hip and bring your left foot over your right calf. Now, rock back and forth. This will stretch your ankle. Do this about 10 times. High knee skips will get your heart thumping and pumping. It is an excellent exercise to stretch your ankle, knee and hips. Start with a skip, pulling your knees high towards your chest. Watch the video to learn how to do it properly.